NASA is interested in partnering with U.S.-based companies to design and develop reusable systems that would help astronauts land on the moon by 2028. The space agency announced its plan on Friday as part of its second Next Space Technologies for Exploration Partnerships Broad Agency Announcement. Under the program, NASA looks to enter into multi-phased lunar exploration partnerships with the private sector and provide funding to build and demonstrate future lunar landers. 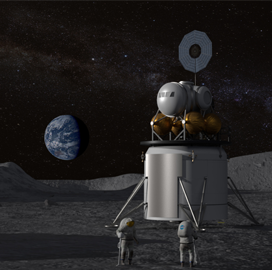 “Building on our model in low-Earth orbit, we’ll expand our partnerships with industry and other nations to explore the moon and advance our missions to farther destinations such as Mars, with America leading the way,” said NASA Administrator Jim Bridenstine. “When we send astronauts to the surface of the Moon in the next decade, it will be in a sustainable fashion." NASA will accept proposals through March 25 and intends to start testing of human-class landers on the moon in 2024.